Northampton Town will release veteran defender Andy Holt and goalkeeper Freddy Hall in the summer. 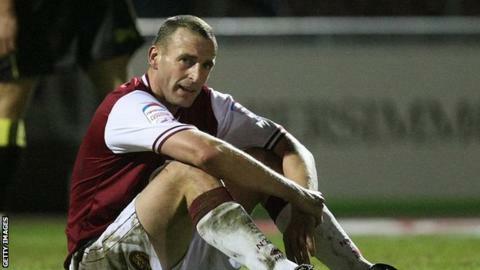 Holt, 34, will end a six-year association with the Cobblers when his contract expires in June. The centre-half, who had a spell as player-coach earlier this season, will leave with 220 appearances for the Sixfields club. Bermudan Hall, 27, has featured three times since arriving from the USA minor leagues last year. "It is always difficult to see a player leave who has done so well for the club over many years," said boss Aidy Boothroyd of Holt. "It is even harder when they are as a good a character as Andy is but things move on and decisions have to be made. "Freddy also goes with our thanks and best wishes and we hope that he too can get himself fixed up elsewhere." The pair join Ryan Gilligan, Jason Crowe, Nathan Wedderburn, Lewis Young and Michael Built in leaving the club at the end of the season.